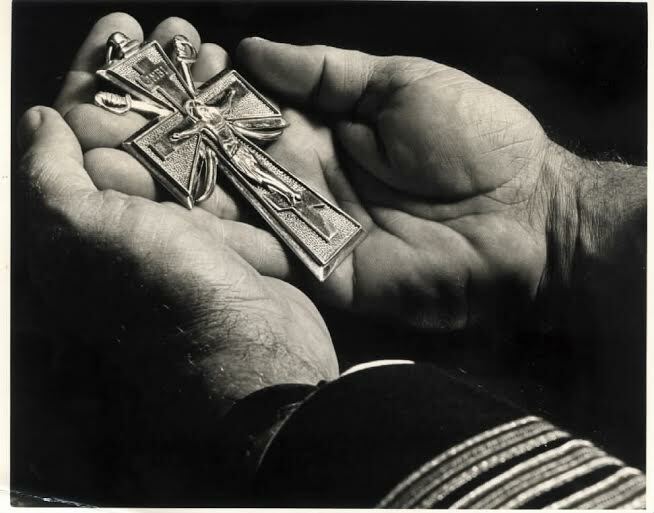 December 2013 marks the 70th anniversary of the establishment of the Orthodox Christian military chaplaincy to serve the spiritual needs of Orthodox personnel in the United States Armed Forces. At the time of America’s entry in World War II, there were no Orthodox Chaplains in the US Armed Forces. Father Vladimir Borichevsky became the first Orthodox priest to enter the US Armed Forces in December 1943. By then, America had been at war for two years, but no one knew how long the war would last. He was soon joined by Fathers Michael Kovach and John Kivko in the Army and Father Alexander Seniavsky in the Navy. Too few to meet the needs of our massively surged and widely deployed forces, Orthodox chaplains were initially assigned to stateside training commands, though Father Vladimir was present during the battle of Saipan. 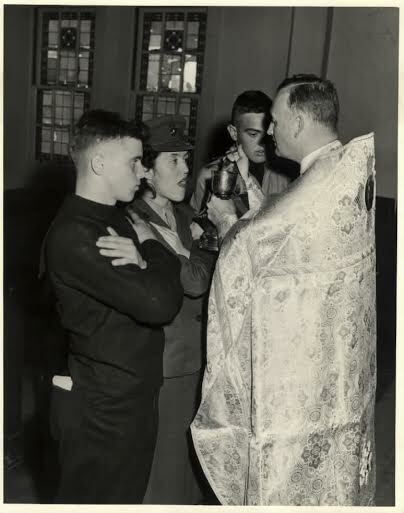 All four priests were discharged from active duty after V-J Day, leaving the chaplaincy devoid of an Orthodox presence until the Korean War, when Father Seniavsky reentered the Navy. It was also during this next chapter that Fathers Nicholas Kiryluk and Basil Stroyen joined the chaplaincy of the youngest branch of service, the US Air Force. From that time on, Orthodox chaplains have continuously served all branches of the US Armed Forces. Fr. 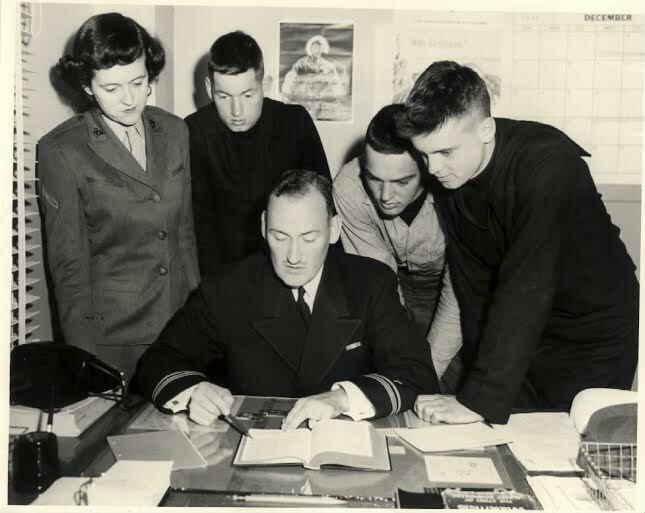 Boris Geeza [later Bishop Boris] communes US Navy personnel in 1954. It is interesting to note that at the 17th annual national convention of the Federated Russian Orthodox Clubs—today’s Fellowship of Orthodox Christians in America—delegates established a fund to equip the first Orthodox chaplain. Cash and pledges amounted to over $600.00. At the 18th convention, Father Dzvonchik informed delegates that Father Borichevsky had been presented with two sets of vestments; two crosses, a baptismal kit, service books, a censer, a complete chalice set, Epistle and Gospel books, icons, and a sacramental record book. Fr. Boris Geeza offers Bible study to military personnel in the mid-1950s. Although the first Orthodox chaplains were challenged to justify their relevance to the institution, their legacy was built upon their steadfast faith set up the current generation of Orthodox chaplains for success. Now sharing fully in the leadership of chaplaincies, they are regarded as vital to the free exercise of religion in our nation’s diverse military. Their sacramental outreach is authentically pan-Orthodox, providing the Divine Liturgy and other offices, as well as a sense of community, to communicants regardless of jurisdiction stationed in far-flung corners of the globe. Fr. 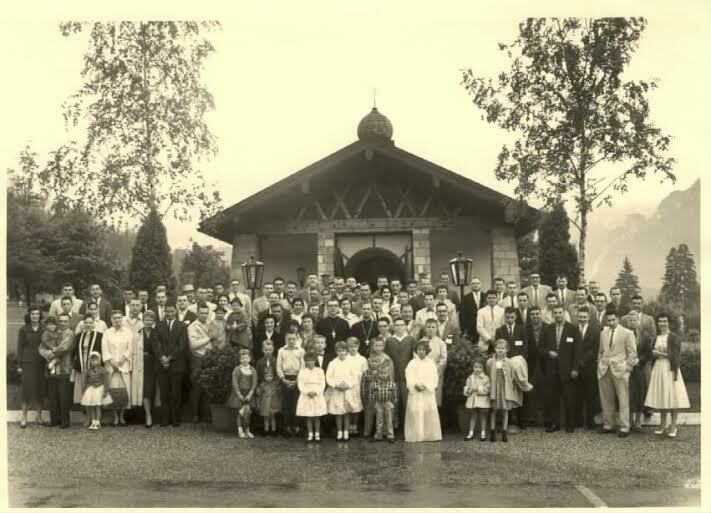 Alexander Schmemann conducts retreat for US military personnel in Germany in the late 1950s or early 1960s. Our priests in uniform provide for Orthodox Christian personnel to the greatest extent conditions allow. Whether serving in ornate chapels or at makeshift altars with laminated icon prints, Orthodox chaplains bring the fullness of God’s Kingdom to the isolated faithful. They have served in every major conflict since the Second World War and are deployed in Afghanistan and elsewhere in the Global War on Terror even today. Fr. 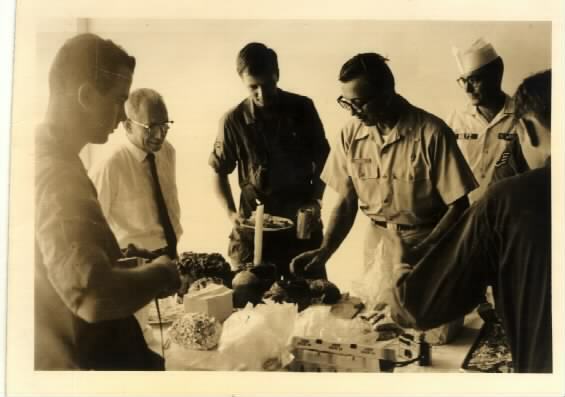 Michael Margitich blesses paschal food in Saigon in 1968. At present, two Orthodox chaplains are preparing to be deployed for the Nativity and Theophany season. Father Eugene Wozniak, Navy Chaplain, will serve with Marine forces in southwestern Afghanistan in December and January. Father John Kalantzis, Chaplain of the USS TRUMAN, currently is deployed in the region. Father Peter Dubinin, Army, will serve a one year tour of duty beginning in January 2014 to Kuwait. Two chaplains recently returned from tours of duty in Afghanistan. Father Paul Rivers returned to Germany, while Father George Hill, who recently was selected to attend Advanced Civilian Schooling for a graduate degree in ethics from the University of Virginia, returned to Fort Bragg, NC. The unique pectoral cross designed for Orthodox military chaplains. Those participating in the War on Terror are among approximately 30 Orthodox chaplains in the Army, Navy and Air Force, their Reserve components, and the National Guard. They provide ministry to soldiers, sailors, airmen, Marines and Coast Guard personnel and act as spiritual advisors to commanders of three and four-star rank. They provide an irreplaceable sacramental presence to Orthodox faithful in uniform while bearing witness to our faith as they care for all service members, regardless of religion. 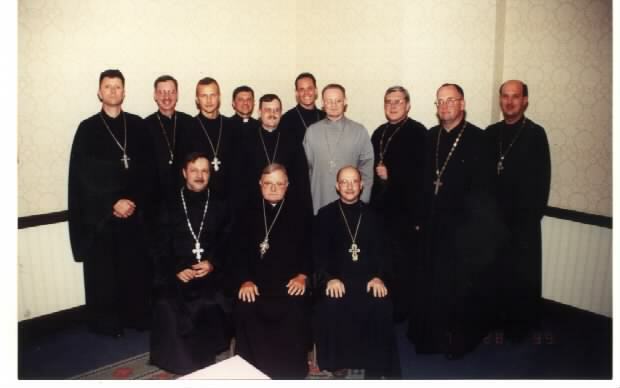 Gathering of chaplains under the leadership of Fr. Gregory Pelesh, Dean of Chaplains, in 1999. The Orthodox priests in uniform serve and minister in all parts of the world and in varied environments and conditions as they provide the continued dynamic ministry with spirituality, dedication, love and professional competency at all time and hours. Many of our Orthodox chaplains and many of the men and women to whom they minister have had multiple deployments. Let us remember our chaplains and veterans and their families in our daily prayers, that God will grant them many years. Those who know of Orthodox Christian men or women serving in the Armed Forces are encouraged to have them contact a chaplain of their own unit who may be able to arrange transportation to the sites where Orthodox worship will be held or to arrange a visit by an Orthodox chaplain to their locations.